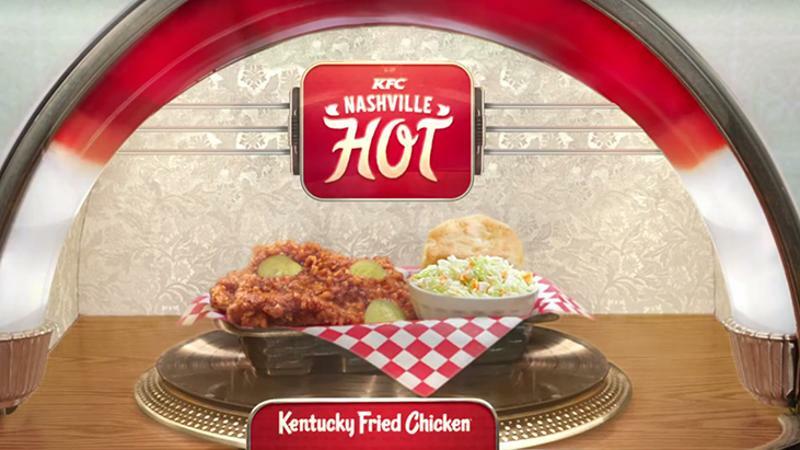 After feeling some heat from customers, KFC has brought back its Nashville Hot Chicken to U.S. units. Nashville Hot Chicken, which KFC served from January to April, was then deemed one of the chain’s biggest product innovations in recent memory. It first drummed up interest for the spicy LTO by offering customers tastes from a mobile food truck that made stops around the country. As part of this month’s reintroduction, the chain is offering the product in a sandwich in addition to tenders and off the bone, and some units will serve Nashville Hot Wings as well as a grilled iteration, KFC said. It noted that customers had clamored for the item's return, particularly on social media. To draw interest, the chain also named Mad Men actor Vincent Kartheiser the Nashville Hot Colonel, the latest Colonel Sanders iteration to be featured in the brand’s advertising. This newly crowned Colonel follows in the footsteps of the product-specific Extra Crispy Colonel introduced by KFC earlier this year. Despite the somewhat mixed performance reported by its parent company, KFC performed rather well during its most recent quarter, particularly in the U.S., where its comps rose 6%.